It's been a great gardening season for local gardeners, if not without some challenges. A very late fall has stretched out the growing season almost a month longer than normal. Leaves have now fallen and the soil is quickly freezing, but not before some local church gardens managed to reap marvelous harvests benefiting those who depend on food pantries. My April 30 column briefly mentioned the new garden of Lutheran Church of Hope, constructed on church woodland and under the tutelage of member and master gardener Don Bladow. Bladow, with the help of his wife, an ELCA hunger initiative grant and the support of a dedicated team of volunteers, has turned that land into a highly productive garden. All of the produce grown on it was transported directly to Lutheran Social Services of Alaska three times weekly, for distribution to scores of their clients. Approximately 20,000 square feet of land was cleared and rotivated, and about 8,400 square feet was planted with a wide variety of vegetables. Surprisingly, the site is very sandy, giving the soil good drainage and root penetration ability. An avid woodworker, especially with regard to wood turning, Bladow converted as many of the birch trees as possible to bowls. Two hundred were sold at the church, raising funds to supplement the initial grant the church received for the project. He plans to make more bowls over the winter for sale in the spring at the church. Of various sizes, they're light, both in color and weight, and a beauty to behold. It's satisfying to hold one and realize you've become part of the project by your purchase. Bladow also made and donated 100 bowls to Bean's Cafe's annual Empty Bowl event. I consider his effort on the bowls alone as a concerted demonstration of putting one's faith to work. A lifelong Lutheran, Bladow says he got the idea for the garden project from the 2015 Alaska Lutheran Synod Assembly, which featured a hunger theme. He began thinking about ways to use the space behind the church. That year, he constructed and planted five elevated garden boxes but found they were not successful. After that, he immediately began clearing the lot. Taking the University of Alaska Fairbanks' online master gardener class, he also approached Julie Riley of the local Cooperative Extension Service for help. She offered him assistance with regard to clearing the land, testing the soil and amending the soil for best fertility. With the help of 20 to 25 individuals — including church members, local master gardeners, the Turnagain Elementary PTO and friends of the church — he installed fencing, constructed a garden shed for equipment storage and planted the garden. Potatoes, carrots, cabbage, squash, cauliflower, broccoli, parsnips, kale, chard and three types of zucchini were planted in 2016. "There is no way I could have done all that needed to be done without help from the congregation," Bladow said. He gives much credit, especially for tending the garden, to his wife, Bonnie, who is also an active volunteer at the "Listening Post" program. The results were astounding: 2,350 pounds of produce went to Lutheran Social Services of Alaska, and this was only their first year. Bladow attributes Jesus' words as the driving force behind his efforts: "Inasmuch as ye have done it unto one of the least of these my brethren, ye have done it unto me." He added, "If I can feed people the results of this garden, my life has been a success." "Don's work, along with other volunteers', was amazingly dedicated and faithful," remarked Lutheran Church of Hope pastor Julia Seymour. "Each harvest brought a joyous 'Glory to God' response. The garden and those who committed to it are a true revelation of how prayer goes beyond words into the actions of our hands and feet. The garden helps LCOH love our neighbors in word and in deed." Unfortunately, many local church gardens start small and stay small, producing a small amount of food for pantries. Such smallness might indicate a lack of faith, of vision or of a spark plug like Don Bladow to get it done. What if more churches got very serious about planting the abundant unused acreage around their facilities, turning it into productive use for others? "We're so blessed to be able to provide fresh, locally grown produce to our clients who use our food pantry," said Alan Budahl, Lutheran Social Services of Alaska's executive director. "This produce helps us to supplement the produce we buy each week, in order to give our clients a better choice. 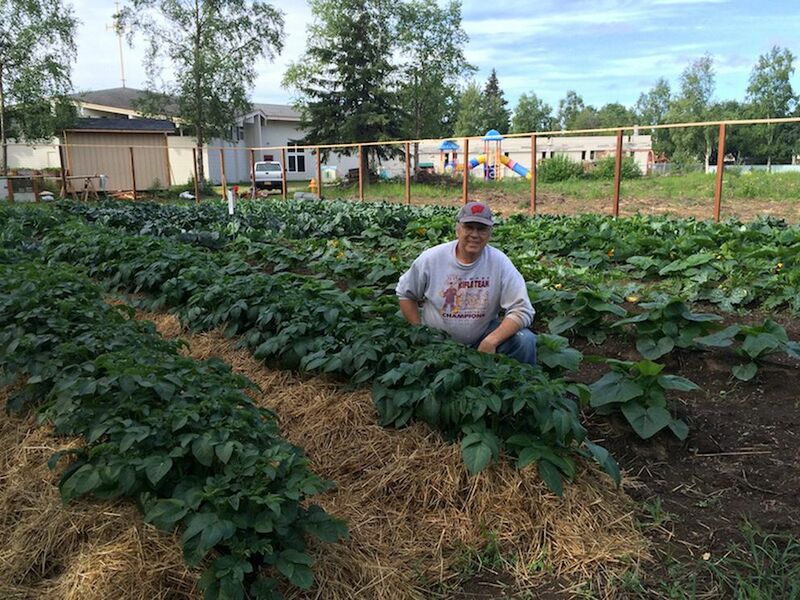 We're very excited about the growth in gardening in our faith-based community in Alaska." "Many people love rhubarb, so don't throw it away but bring it in to us, leafy tops removed," Budahl added "Our clients love it. Consider finding the video 'Just Eat It,' which is excellent in showing how much food is tossed away in America." To the many other churches in the area that offer plots for community gardens, I offer hope and encouragement to continue. I strongly believe they help build community. Now is the time for faith-based organizations to plan for their 2017 gardens.